Are CF bulbs really a good idea? I’ve been using compact flourescent lights in my home for a few years and feel like I’m ‘doing my part’ to help save the planet. My wife assures me that I’m being an exemplary ‘Treehugger’. I purchased these bulbs on my own without any inducement to do so other than curiosity. But I recently heard that some misguided do-gooders are trying to outlaw incandescent bulbs. Even though that might not affect me too much since I’m already ‘with the program’, so to speak, I’m not a big fan of government intervention, unless it’s for a really good cause and unless it can be proven to solve a problem without introducing some other unintended consequences. Not everyone is ‘on board’ when it comes to CF bulbs. A friend had asked me whether CFs light bulbs really have much of an impact on global warming by reducing the amount of CO2 that our fossil fuel-powered electric plants spew into the atmosphere each year. He wondered whether anyone had taken into account the beneficial effect of the heat incandescent bulbs generate in the winter time that offsets the load on the residential furnace. I had to admit, I had never heard of anyone who had taken that into consideration. So I decided to do some calculations myself. An incandescent bulb converts only about 2% of the input power in usable light. A CF bulb produces about 4 times as much usable light per watt than an incandescent light bulb. At this point, if I were on the usual trajectory of discussing energy savings, I’d be ready to start gushing about the number of tons of CO2 that could be avoided if everyone were all to switch to CF bulbs. But I’m not going to do that because talking about tons of CO2 doesn’t really tell anyone anything. Why even bring up the CO2 number at all? It really boils down to how much of a percentage impact you can have on a problem. Mixing pounds or tons of CO2 reduction when talking about energy efficiency is a complete non sequitur and does nothing to put energy savings in perspective. If I can tell you how much of a percentage savings you can expect with CF bulbs, then you can tell if it’s a big deal or a little deal and draw your own conclusions about its impact on CO2 reductions. If an incandescent bulb is 2% efficient at converting electricity to light and a CF bulb takes about 25% of the energy to produce an equivalent amount of light, then it follows that it’s about 8% efficient. So, you might ask, where does all that other energy go that is not being converted into beautiful lumens of light? The answer is that it is converted into heat. Actually, even the lumens of light also end up as heat too, which means that after it has bounced around the room a few times, all the objects, including your retinas eventually turn those lumens into heat as well. As you move away from the equator it’s necessary to use more interior lighting in the winter than in the summer due to the fact that the nights are longer in winter. If we need to use our lights longer, and all the energy used by the bulb eventually becomes heat, it begs the question, “Are these lights helping to offset the amount of work my furnace has to do?” For about 6 months out of the year my furnace runs at least a little bit each day, so yes, you can assume that the heat generated by my lights, and for that matter, my refrigerator, TV, computer, etc., all help to offset the amount of work that my furnace would otherwise have to do to keep my house at a comfortable temperature. It would only be fair to acknowledge that in the summer, the opposite would be true, i.e., all my electrical loads counteract the work that my air conditioner needs to do during the time I’m running it. But the winter months are when a typical house consumes most of its energy primarily for space heating needs. So, how much ‘help’ does my furnace get from my lighting, and how does it offset the cost of heat when compared with the cost of natural gas that handles the bulk of that task? In a previous article I wrote for another website, I showed the effective cost of producing 1M BTUs using various fuels based on current prices and conversion efficiencies. There is a table in that article that shows that natural gas effectively costs about $14 per MBTUs based on a furnace with 85% efficiency. For a similar amount of energy from electric resistive heat, which is 100% efficient, the cost is about $26 per MBTUs assuming a $.10/kWh electricity cost. A typical household in the U.S. uses electricity at the rate of 1 kW. This results in an average electric bill that is 720 kWh per month or 8760 kWh per year. You can multiply those numbers by $.10/kWh to figure the monthly and yearly average cost of electricity in the average U.S. household. Please note that U.S. kWh rate varies considerably by geographic area from as little as $.06/kWh to $.25/kWh with the average being around $.10. Prior to the widespread use of CFs, about 9% of residential electricity consumption was attributed to lighting according to the U.S. Department of Energy’s website. Since heating values are typically measured in BTUs (at least here in the U.S.) I will convert the electricity used for lighting into heat using the standard conversion factor of 3412 BTU/kWh. It gives a value that the lighting load in an average residence of about 7400 BTU/day. In the winter, we can assume this is higher, and in the summer, it would be lower due to the difference in the length of the days. I will use 10,000 BTU/day for winter months and 5,000 BTU/day in the summer for simplicity’s sake. A typical household in the U.S. uses about 90 M BTU per year for space heating and most of it is consumed during 4 months in the winter. That would be a heating load of 750,000 BTU/day on average. This means that a typical furnace consumes about 75 times as much energy during the winter as all the lighting in a house. Heat generated by lighting will thus offset the furnace load during the winter months by about 1.3%. In the summer, the heat load that lighting generates will need to be offset by the air conditioning, and thus will increase air conditioning cost, and using the numbers from the same DOE website shows that 16% of annual electricity consumption attributable to air conditioning. In the event that all 16% of the air conditioning bill was generated during 4 months in the summer then the monthly average consumption would be 350 kWh during those months. This corresponds to 12 kWh per day. Using a conservative SEER of 10 means 12 kWh translates to cooling of 120,000 BTU/day. (See my article on Heat Pumps for the definition of SEER and other efficiency ratings.) With the 5000 BTU/day of heat generated by lighting in the summer, the air conditioner has to work 4% harder to compensate for the heat generated by the lights. CF bulbs are more expensive to purchase than incandescent bulbs, about $1.50 vs. $.50 each for a 60W bulb. But they last about 8 times longer, so even with the higher purchase price, you will spend 63% less per bulb replacement cost overall. Again using the 9% of an electrical bill over a year, the lighting consumption comes out to an average of 788 kWh per year. That’s like having 1.5 60-watt incandescent bulbs burning all the time. If you did that, each light would need to be replaced about 8 times per year (assuming an 1100-hour life) for incandescent bulbs vs. 1.5 times per year with CF bulbs (assuming an 8800-hour life). So the bulb replacement cost savings are an additional $1.75/yr. So it appears that the electricity savings + reduction in air conditioning + reduced in cost of replacement bulbs – loss of heating in winter still makes it more economical to use CFs over incandescent bulbs. It’s interesting to note that the savings in electricity is by far the dominant contributor to the savings calculation. But in the grand scheme of things, a reduction of $52.48 in a combined heating + electricity bills of around $2100 annually is less than a 2.5% household energy savings and thus isn’t going to make a big dent in global warming or reduce our dependence on fossil fuels very much. It would seem that passing a law to make incandescent bulbs illegal is just something to make people who are unable to do math feel good about themselves. Maybe they can express it in tons of CO2 savings and obfuscate its contribution even further. Let’s just call it what it is, a potential 2.5% energy savings which is not nearly enough incentive to pass a law when the simple economics should provide enough of incentive, not to mention cutting one’s bulb replacement workload down by 87%. Now I know that some may want to take me to task for my criticizing CF bulbs for making minimal contributions to the goal of overall energy reduction, but I am a tired of people saying things like, “But if everyone just did a little, we’d save a lot“. No, we really wouldn’t. If all 100 million households in the U.S. save 2.5% of their electricity bill by switching to CFs, the overall savings are not 250,000,000%, as some math-challenged people may think, they are just 2.5%, overall, period. Savings like this would get eaten up in about 3 years with a population increase which is occurring at nearly 1% per year in the U.S.. I wish that everyone would just talk in terms of percentages when it comes to reducing energy consumption and not obfuscate the issue by introducing tons of CO2 emissions or some other unrelated metric into every energy discussion. One of my favorites is using an seemingly impressive expression such as ‘equivalent to taking 100,000 cars off the road’. Just to put that in perspective, there are 600 million motor vehicles in the world, so, although 100,000 sounds like an impressive number, it’s less than .01 percent of the total. Just in case there’s any doubt, I consider a .01 percent improvement to be a insignificant contribution that is hardly worth talking about. So I think we should stick to percentages when it comes to energy improvements. To eliminate modern society’s dependence on fossil fuels, we will need to find ways to significantly reduce energy consumption as well as simultaneously figure out how to augment and eventually replace nearly all of our current energy production with renewable energy sources. I don’t think we can legislate a solution into existence by targeting small contributors like residential lighting. If we want to be a good “energy efficiency fascists” so as to modify people’s behavior with legislation, then we’ve should be attacking energy consumption on a larger scale while simultaneously replacing massive amounts of generating capacity with renewable sources. A 2.5% reduction that already has an economic incentive would be unlikely to benefit from further legislation to outlaw incandescent bulbs. Besides, there are some applications that incandescent bulbs can do where CF bulbs would not work well, such as lighting the inside of a refrigerator. CFs take about a minute to warm up and so a refrigerator is much better served with an incandescent bulb. It’s only on when the door is open, after all. I guess I should also mention the controversy of the mercury in CF bulbs. Mercury has been used in fluorescent bulbs ever since they were invented in the 1930s, and no one gave it much thought. Commercial and industrial lighting applications converted over to fluorescent bulbs years ago and have had methods for their proper disposal going back decades. The disposal method for a burned out CF bulb is to put it in a sealed bag and bury it in a landfill so that it doesn’t end up in our water supply. One source of methyl-mercury that ends up in fish comes from burning coal, which goes into the atmosphere, comes down in rain, and can concentrate in fish. 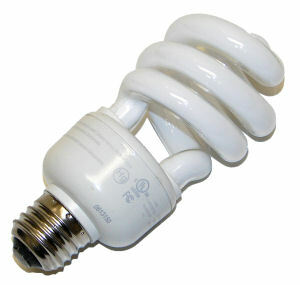 Since CF bulbs require less electricity, hence less coal is burned to generate electricity, the overall effect of the mercury contamination concern is reduced with CF bulbs, but this is often neglected because of the hysteria about what to do if a CF bulb breaks, a topic that has been answered by the EPA. So in conclusion, I think that CFs are a good idea that need no further government legislation to get them to be more fully adopted. There’s speculation that they may even be replaced with LED technology in the future which will eliminate the mercury concern, but I think that may take a while. I’ve been using a white LED for reading lamp and it is 1000 times more efficient than using a 60W incandescent bulb, but that’s mostly due to a behavioral change, since I’m lighting up just the reading material, not the whole room with the reading light. Those are the types of changes it will take to get off the fossil fuel gravy train. In reality, the number of lumens per watt for a white LED are only about 50% more efficient than CFs today. Even with the further LED technology improvements in the number of lumens per watt, it won’t be quite the 4x jump in efficiency that we made by going from incandescent bulbs to CFs, but perhaps another 2X improvement over CFs, which would be worth switching if they can get the multi-watt LED lamp costs to be competitive with CF bulbs. Today, for limited power requirements such as flashlights, the switch is already happening which is why you are seeing more and more flashlights switching to LED technology. You must be an engineer. I am a technition. You guys are always proving everything with your complicated math scenarios. What I would like to see is someone with your analytical skills examine some real solutions. What would happen if we take the led out of its little box and use it the way it was intended to be used. Make it a little larger, perhaps, and use dc power only. No conversions to ac. No higher voltages. Then you say, what will power it? How about a solar panel and a capacitor? Or a single motorcycle battery. This might light a home all evening. Now you take that idea and power all your 12V dc appliances. How many are in your home now? Every laptop, every led fixture, every small electric motor. Here’s a thought. I have worked in ceilings of office buildings. Do you know how hot all those flourescent fixtues get? It’s enough to heat your home all night. Above the ceiling tiles. Cooled by A/C all day long. Wasted power heating up an airconditioned building. We waste energy with all this nonsense. You engineers have been telling us why solar power wont work for years. The science is solid, it’s the political economic math that corrupts advancement and keeps us burning all that expensive dirty wasteful carbon fuel. Did you say 2/3 of electricity is wasted as heat in generation plants? Why don’t we just abandon 120v ac for something not so inefficient. I don’t want to hear about complicated conversions based on models. I have a meter, and I know how to use it. Every cellphone charger, every laptop “power supply”, which is nothing but a battery charger/step down transformer is a waste. We don’t need these things. We hardly need ac anymore. We need to put dc to work where it can be used, and stop all this converting. I refuse to believe we can’t engineer an A/C unit that runs on dc. Nasa made a spacesuit that cooled men on the moon. How did they do that?